Dr Tin Ponlok, Secretary General of Cambodia's National Council for Sustainable Development said, “Adaptation Finance is a key issue of the COP as Least Developed Countries (LDC) need to scale up the finance they have already received”. 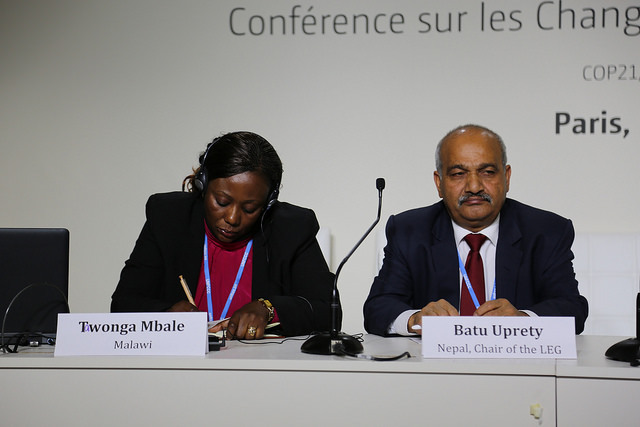 3 December 2015, Paris, France: On the side of the Paris Climate talks, the Global Water Partnership (GWP) with the joint UNDP-UNEP NAP Global Support Programme (NAP-GSP) supported the governments of Cambodia, the Gambia, Malawi and Senegal to organise a side event on adaptation finance. The event, convened by government of Cambodia, presented perspectives from these countries on policy and financing instruments in place to scale up adaptation, and highlighted to challenges and requirements. The speakers all stressed the importance of The GEF–administered Least Developed Countries Fund (LDCF) as a dedicated mechanism which recognises the LDCs’ specific requirements. Issues such as direct access to the Adaptation Fund and the Green Climate Fund, or the role of the private sector were also discussed. Mr. 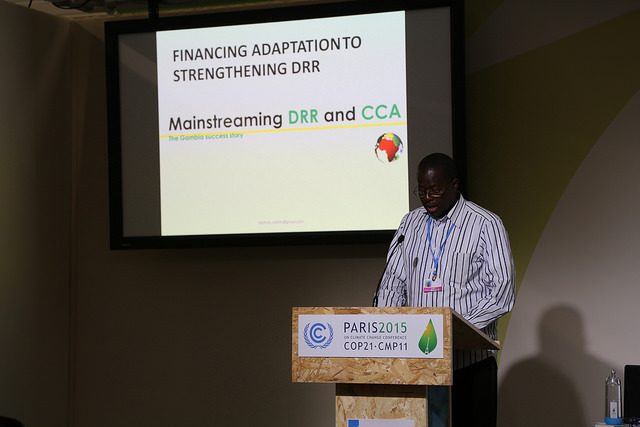 Sum Thy from Cambodia presented the country's climate financing framework, which was adopted in November 2014. He said, "Efficient mobilization and management of climate change finance will be essential to put our countries on a sustainable development path". Mr. Thy also recommended key actions to enhance climate finance, such as improving tracking of climate finance in the national budget and in the ODA database, monitoring the effectiveness of climate change-related expenditure, introducing tools to prioritize the most efficient and effective measures in the budget, and strengthening the coordination of the various sources of funding (including direct access to various multilateral funds) and the alignment with national priorities. Alpha Jallow, UNFCCC Focal Point of the Gambia said, “The private sector should be also tapped through taxes, such as the tourism sector for instance”. This statement was reinforced by Pa Ousman Jarju, Minister for Environment of the Gambia who said, “National funds (need) to complement international funds”. The importance of strengthening institutional capacities for direct access was highlighted, by Madelaine Diouf Sarr, UNFCCC focal point for Senegal. She observed that the experience with the Adaptation Fund could assist National Entities to be ready to access climate finance funds such as the GCF. Country ownership is also a key aspect, and countries have developed their institutional framework to adapt to climate change for many years since the formulation of their National Adaptation Programme of Action (NAPA). However, LDCs need support to build their capacities with regards to their climate change awareness and knowledge, ability to develop bankable project proposals, and adaptation monitoring. These aspects among others were stressed by Tawonga Mbale, Director of the Department of Environment Affairs of the Ministry of Natural Resources of Malawi. South-South Cooperation was also mentioned as one of the main approaches to help strengthen capacities. The Chair of the LDC Expert Group, Batu Uprety highlighted the opportunity the NAP process provides with regards to coordinating efforts and scaling up adaptation measures. He declared, “All our efforts through the NAP process must target and reach vulnerable communities”.